If you’re dedicated to DIY and want to paint a room yourself, don’t just grab a brush and a tin of paint, and hope for the best. You’ll regret it. Follow this guide and you’ll save yourself hours of frustration. Preparing well will not guarantee a perfect finish, but you won’t get a perfect finish without it. Put time and thought into your preparation and you’ll not only avoid time-wasting mistakes, you’ll also avert longer-term problems such as flaking paint. 1. Get good-quality paint. It will look better and last longer. Make sure you choose the right paint for the purpose. For example, use a semi-gloss or satin finish in a kid’s room, not a flat paint – or else you’ll have lots more work to do cleaning handprints, footprints, crayon marks, etc. And note that a shiny paint will show up any imperfections on a wall. Also, get enough paint or you will run out when you’re up the ladder applying a master stroke to the ceiling. 2. Get good-quality brushes (unless you like bristles in your paint) and rollers. 3. Dress suitably. Don’t put on your evening dress; wear old clothes and shoes – and you may be glad you covered your hair. It’s best to remove any vents, the handles and knobs from doors and windows, and – after you’ve turned off the power – electrical covers (keep the screws together!). Use tape to cover the wires in the outlet boxes. Take down the draperies and drapery fixtures. Loosen the light fixtures, let them hang, and use plastic bags to wrap them. Also remove any hooks or nails. 5. Repair all surface defects on the surfaces to be painted. Fill any holes with spackling paste. When it’s dry, sand the area smooth. 6. Sand glossy surfaces so that the paint will adhere. Or use a commercial deglosser or trisodium phosphate (TSP), which you can buy in a paint or hardware store. You can degloss wood in the same way, or sand it with medium or fine sandpaper. 7. Clean the room and all surfaces. Vacuum the room and then wash the surfaces with warm water and a detergent or wall-cleaning soap. To remove grease and grime, use TSP (trisodium phosphate) or a phosphate-free substitute. Then wash the surface and let it dry. 8. Cover the floor and furniture that remains, with plastic sheeting and canvas dropcloths (or old bedsheets). 9. Mask areas that will not be painted. Apply tape as necessary around doors, windows and moldings, using painter’s tape. It’s best to use blue tape or another low-stick tape. Apply it in short lengths (two feet long at most). Press it firmly on to the area and make sure there are no folds or bubbles where paint might seep in. Remove the tape before the paint dries (check the information on the paint tin to see how long this will take) or else you may also accidentally pull paint up from the surface. Pull off the tape slowly and steadily at a 90-degree angle to the surface so that the tape will ‘cut’ the paint cleanly. 1. Start with the ceiling so paint splashes don’t end up misdecorating an already painted area below. ?Don’t worry about cutting in (that is, painting where two edges or colors meet) the ceiling edges to perfection, as you will be cutting in the walls later on. If you have a cornice in a different color, paint it next. There is disagreement about the next step. Should you paint the woodwork before or after the walls? ‘Woodwork first’ argument: Any spatters on the wall don’t matter much since the wall will be painted later. ‘Wall first’ argument: Rollers give off a fine spray of paint no matter how careful you are. Some of it is likely to find the woodwork. We advise to paint the walls first, since it’s easier to fix the odd spatter than widely spread spray. 2. Now paint the walls. You can paint in sections from top to bottom or side to side as you wish. Cut in neatly at the ceiling or cornice edges. 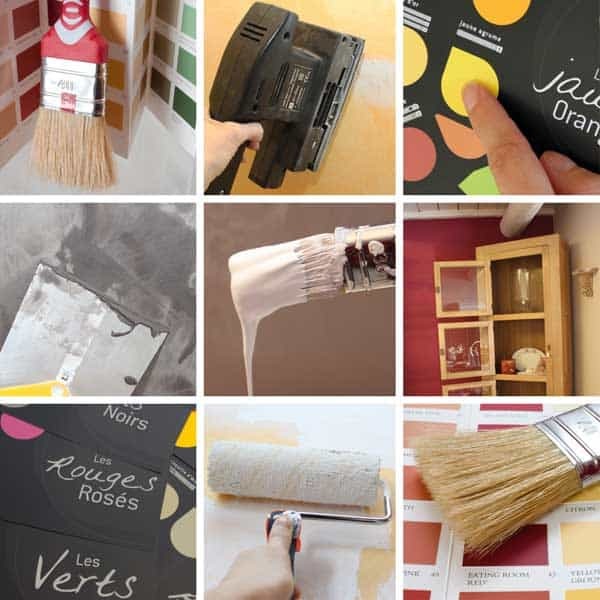 Paint the whole wall before taking a break or the painted parts will lose their wet edges. Then scan the wall, and paint any missed areas and fix any smears. 3. Next, do the trims and the woodwork. Cut in carefully to the walls. Lightly sand and dust down between coats. 4. Paint the skirting boards. It’s worth learning how to use a brush properly – to ensure a good finish and to avoid aches in your muscles. Hold a trim or sash brush the same way you’d grasp a pencil and you’ll be able to manipulate it with great control when you’re doing fine paintwork. Use your whole hand to grasp the beaver-tail handle on a large brush. How much paint should you load on the brush? The maximum amount, but not so much that the paint will end up dripping uncontrollably. Experiment as you hold the brush over the paint tin and you’ll quickly measure the ideal amount. On large surfaces, apply the paint in sections of two or three square feet. It’s worth learning good painting techniques – but that’s a subject in itself. It’s easier to use a roller than a brush. To paint ceilings, use a roller with an extension handle so you can do the job from the floor and not have to move a stepladder around. Fill the well of the pan about half full, dip the roller into the middle of the well, then raise it and roll it down the slope of the pan – but stop before the well. If you do this three times, the paint will work well into the roller. Next, again dip the roller into the well and roll it on the slope until it is covered with paint. You’ll know quickly if you’re applying too much paint – the roller will drip as you lift it away from the roller. When painting, keep the roller on the surface all the time as you roll it in a zigzag direction and then apply horizontal and vertical strokes to fill in the uncovered areas. It’s best to paint in sections of two or three square feet. On a vertical surface, start by rolling upwards. If you start with a downward roll, the paint may gather in a puddle and run down the wall. When you’re lifting the roller, do it slowly so it doesn’t leave a mark behind. Since rollers can’t go tight to edges, you need to use a brush along the ceiling, and in corners and moldings. To avoid contrasting brush and roller marks, cover the brush marks as much as you can with the roller – but don’t load it with paint when doing this. Avoid creating lines, ridges and lap-marks by maintaining a wet edge all the time. You may have to work fast so that you’re always applying new paint on to paint that’s still wet, but you’ll get a good finish. Most DIY beginners spend too long applying the paint. Do this rapidly, then spread and smooth it quickly. Keep a wet rag handy and use it to pick lumps off the wall as they arise. Note that, for very large areas, you can use an airless sprayer. If you do, make sure to follow the instructions carefully.